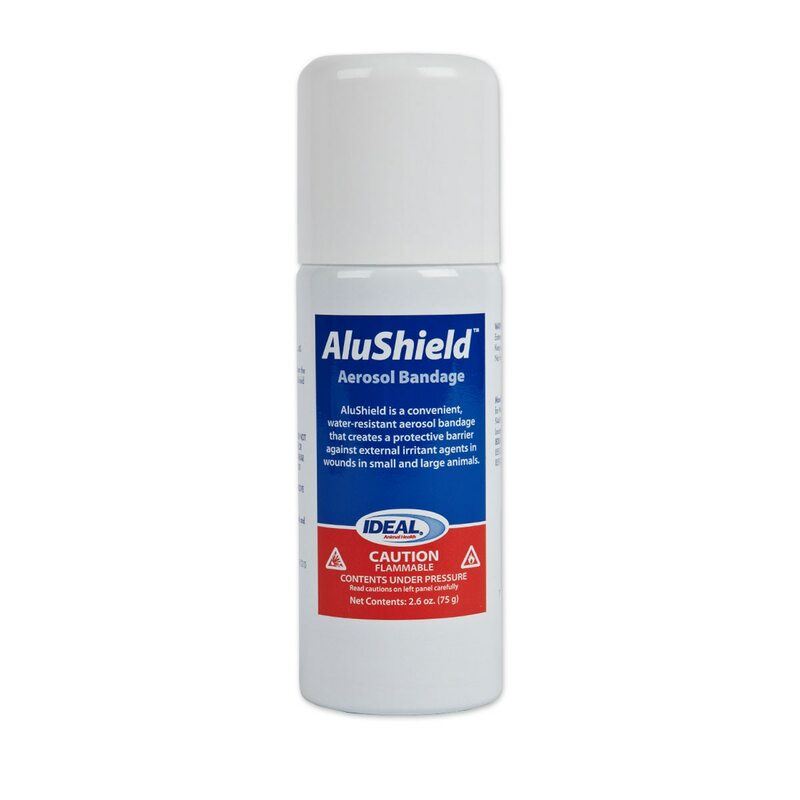 AluShield Aerosol Bandage is rated 4.9 out of 5 by 70. Rated 5 out of 5 by SCCowgirl from Great for protection against insects. This is an easy way to cover minor scrapes and cuts and protect them from flying insects. I always have a can on hand. Rated 5 out of 5 by ntennie from So simple! I love this spray on bandage. It keeps wounds clean and is so easy to use. Just clean the wound, spray on and go! Rated 5 out of 5 by Newottbmom from Love this! This is the perfect product to easily seal wounds from bugs in the summer. I put some ointment on a fresh wound and then spray this over and keeps gnats and flies off while it heals! Rated 5 out of 5 by PonyChick from This stuff works great! My granddaughters pony got some nasty deep scratches near her hip bone. I was using antibiotic ointment and some Swat around it and it was looking ok but then I noticed some proud flesh starting. I quick ordered AluShield and I couldn’t believe the difference in the wound. 2 times spraying it and it looks wonderful. I will be using it for all nicks and scrapes from now on!! Rated 5 out of 5 by Ashley from A first aid must have! I always have this on hand for minor cuts and scraps to keep the injury clean. A must have! Rated 5 out of 5 by Liz R from AluShield Aerosol Bandag I have been using this for years on my horses after cleaning wounds and spraying with an antiseptic I use this liquid bandage to keep area covered & protected until wound fully heals! Rated 5 out of 5 by Horse obsessed from Easy to use Acts as a great protective barrier and allows superficial wounds to heal fast. Rated 5 out of 5 by cmarks815 from Love AluShield - a must in my first aid kit! Love using AluShield Aerosol Bandage for minor cuts, etc. on my horse.